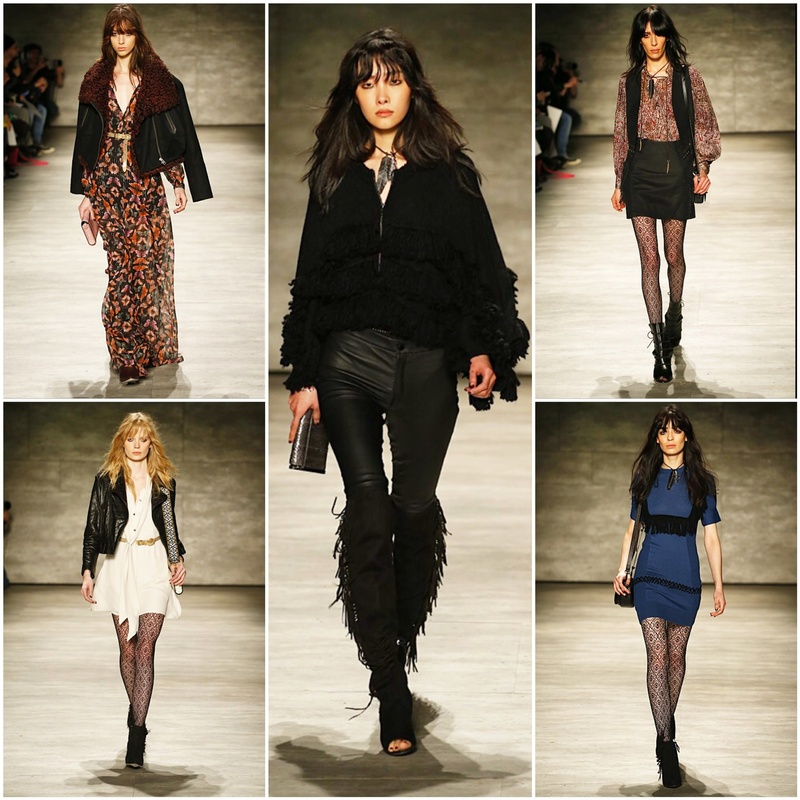 The rocker chic vibe dominated Rebecca Minkofff’s Fall 2015 collection presented at Mercedes-Benz Fashion Week. The collection seamlessly fuses 1970s style with the glamour of rock and roll—think Janis Joplin and Stevie Nicks à la Fleetwood Mac—for the modern-day woman, who isn’t afraid to take risks. Sometimes runway styles may be a little over-the-top for everyday wear, but not the case here. Minkoff hits a melodious chord with her Fall line. The collection resonates with a certain type of woman—gutsy, bold, and stylish. The designer played with textures (e.g. shearling, velvet, leather, suede) and mesmerized with flowing, sheer fabrics to create the essence of “cool girl chic.” The collection echoed similar fall trends spotted in the opening show by BCBGMAXAZRIA at New York Fashion Week. These top 10 looks from Rebecca Minkoff’s fall collection embodies the kind of versatile styles regular, non-celebrity types can wear with confidence without looking like something that walked out of American Horror Story’s Freak Show. What do you think? What looks would you rock-out in? Photo Credit: Courtesy Photo via Women’s Wear Daily. View the slideshow at WWD for all the photos from the runway show. This entry was posted in Style Talk and tagged Fall 2015 Trends, Fall Fashion, Mercedes-Benz Fashion Week, New York Fashion Week, Rebecca Minkoff. Bookmark the permalink. Ah! I love this collection 70’s rocker is my absolute favorite. I am impressed that this is coming from Rebecca Minkoff. It is definitely a new look for her. I am in love with the center photo. I would wear that red crush velvet skirt anytime! I agree! This type of collection is a surprise from Rebecca Minkoff. She took a risk going in this direction for the fall collection but I absolutely love it. That red velvet skirt and matching jacket has the right kind of pop and attitude that makes the whole look stand out. I like the blue dress on the right. The blue dress with the fringe is definitely beautiful. It’s feminine and edgy. Good choice!